I am very grateful and I thank God that I found Dr Wilson’s information and products. Also, I just purchased his book too. It is a blessing to have some answers to our health concerns. I continued to drag myself through life and work. Then, enter my sister, who found Dr. Wilsons’ book and shared it with me. I am so encouraged. Thank you, Dr. Wilson, for your healing work. I am very grateful. I purchased Dr Wilson’s adrenal book about 1 1/2 years ago and it helped me greatly!! I have followed what my nurse practitioner had in place and read Dr. Wilson’s book from cover to cover! !…3 TIMES!! I’m so happy he wrote this book. I really believe in his products and Dr. Wilson. I’ve read his book and have incorporated the nutritional recommendations. The book is phenomenal. It tells you everything you want to know about adrenal fatigue and I like it for that! I absolutely love the book by Dr. James Wilson. Please thank him for writing such a well-needed masterpiece. Dr. Wilson, I am so grateful for your book!! This book has been a major part of my life! It’s teaching me what to do and how to live and what to eat to help me become healthy again. I am so grateful. I’ve gained more insight into this problem, because of reading his book, than all the doctors I’ve seen (many) and all the other books I’ve read, combined. I’m recommending it to my friends and family. The book has changed my life and the way I run my practice and I was honored to hear Dr. Wilson speak at the WAPF conference this past weekend. I’ve just loved his book; I’ve just read every page! Dr. Wilson’s book is like my bible! I loved it so much that I bought two more to give to friends who would definitely benefit from it as I have. Regarding the book Adrenal Fatigue: The 21st Century Stress Syndrome: It’s like a hallelujah book! It’s all about me and I’m so excited to get started on the products! The book is really helpful! My pharmacy recommended the book and I am happy they did. First, let me say I enjoyed your book. It has given me some hope that I can turn my health nightmare around. Thank you for the book!!! Honest to goodness, this book has changed my life. I am reading Dr. Wilson’s book and I find it fascinating! His book is just wonderful, I read the whole thing and saw my life explained on the pages. Dr. Wilson’s book is so helpful. It is nice to be able to use the book as a resource. I love Dr. Wilson’s book! Please tell Dr. Wilson thank you for this book – I have been looking for this all of my life! I just wanted to let you know that your book saved my life!! I have suffered from adrenal fatigue for a long time and I read the book and realized that there were so many people just like me – it gave me the desire to turn my life around. I am in the process of reading the book. It is very inspiring. We have found the book to be very helpful and convenient. Dr. Wilson is The Man! I wish every medical doctor would read his book and realize that adrenal fatigue is real! I am so glad that Dr. Wilson is here for us! I found Dr. Wilson’s book just lying in the waiting room of my dentist’s office of all places. My life changed from there on. Dr. Wilson saved my life! I have been sick for so many years and nothing has helped me. I truly believe that the Lord has led me to Dr. Wilson’s book because as soon as I started to read the first few pages I knew I was finally on the right road! If it weren’t for Dr. Wilson and his book, those of us with adrenal fatigue would be all alone. He is the top expert in the world on the subject; there is no doubt in my mind! I have finally gotten the answers I’ve been looking for after reading the Adrenal Fatigue: The 21st Century Stress Syndrome book. I want to thank Dr. Wilson for writing it. I am just so thankful for Dr. Wilson’s book. Every doctor needs to have this information. I am going to do everything that I can to get the word out! I would like to thank you for writing this book. I will be ordering a bunch more for my friends. It has been a great help to me! I just wanted to write a short note to thank you for your excellent book Adrenal Fatigue: The 21st Century Stress Syndrome. Through God’s grace I stumbled on your book about 6 months ago. ll I can say is THANK YOU, THANK YOU, THANK YOU! I think that this is a very appropriate time for a book like yours to be available in view of the most stressing events of September 11th. I wish you great success with it. Your book was the solution for me; it allowed me to finish what I had started with my lifestyle changes. I am a college student to whom your book Adrenal Fatigue: the 21st Century Stress Syndrome was recommended and I have come away with a whole new perspective on health. This book is my pick of the year. Thank you for writing your book on adrenal fatigue. It is truly the first book that I have found that is so thorough, easy to read and I know will be extremely helpful. I know that there will be many people blessed through your dedicated work. 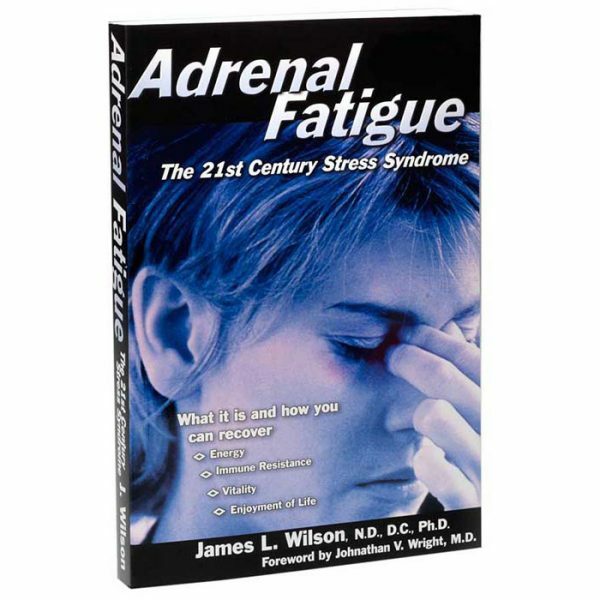 By chance I found a book about low adrenal function, Adrenal Fatigue: the 21st Century Stress Syndrome by Dr. James L. Wilson. If you suspect that stress is making you tired and ill, I highly recommend you read this book. Dr. Wilson’s book on adrenal fatigue is an excellent work, and I routinely prescribe it to patients suffering from this syndrome. I read your book in 1 day & loved it! I would never have heard of your book if I hadn’t started seeing a homeopathic physician. Thanks so much for writing the book in a way that non-medical persons can understand. The human body amazes me! I love your book. I just wish I had bought it ten years ago. Like many people I’d never heard of adrenal glands & what they do. I didn’t even know of their existence! Your book has taught me a valuable lesson in life. I can’t thank Dr. Wilson & his team enough. Through Dr. Wilson’s book I have learned how to take care of myself and get a better night sleep. Thank you so much you have changed my life!! There’s no THANK YOU big enough to say to Dr. Wilson for taking time to write his book! And the fact that he wrote it for those of us who suffer and need it the most! Thank you so much Dr. Wilson for your book! What a life saver.